The elections are over and almost all the votes are counted. It is now clear: I have been elected Member of the Swedish Parliament. I feel very honoured. I am grateful to everone that has voted for me and the Left Party. Thank you! I will especially work with issues dealing with climate change, animal rights and global justice. I feel passionate about working hard for replacing the current neo-liberal government with a red-green. That struggle starts here and now: A new government and new politics, thats what Sweden needs. In the March 29 election, the Democratic Society Party, DTP, made major gains. They doubled the number of DTP mayors, from 50 to over 100. At the same time, fully 100 leading members of DTP have been detained by Turkish authorities for alleged connection to terrorism or “insulting Turkishness” (according to Article 301 of the Turkish constitution). “It is obvious that the Turkish state is incapable of accepting the DTP’s electoral success. We will be pressuring Turkey to release all of the prisoners and stop the repression,” says Jens Holm, MEP, GUE/NGL and the Swedish Left Party. In the major city of Diyarbakir in eastern Turkey, the DTP’s candidate, Osman Baydemir, was elected mayor. He now risks being sent to prison on terrorism charges as the result of a farcical judicial process that has been initiated against him. “The charges against Osman Baydemir must be immediately withdrawn. If he, as a duly elected representative for one of Turkey’s largest cities, can be charged with terrorism, no-one is safe,” says Berivan Öngörur, the Swedish Left Party, candidate to the EU Parliament. On July 1, Sweden assumes the Presidency of the EU. Amineh Kakabaveh, Member of the Swedish Parliament for the Left Party, feels this would be a fitting occasion for pushing for better conditions in Turkey. “The Left Party and I will work to see that the Swedish government makes a point of taking up the situation for Kurds and other minorities,” she says. Below a short note I wrote for my GUE/NGL-friends. 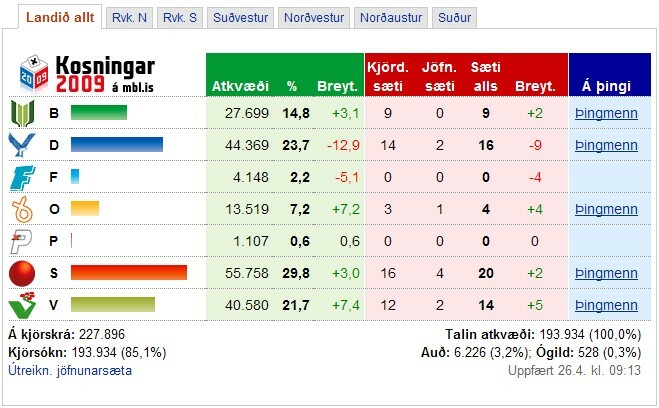 You have probably already heard about the results from this week-ends electon in Iceland. Our sister party: Left Green (VG) increased from 14 to 21.7 per cent, making them the third biggest party. They and the Socialdemocrats, 29.8, have now a comfortable majority. The Left Green has been the only party which has been firmly against the neo-liberal politics on the island. Today more and more realize they been right all the time. The new political ”Civil Movement” got about 7 per cent. That is also a promising and interesting expression from the Icelandic people. A possible EU accession could be one tricky issue in the future. The Left Green are against, the Socialdems in favour. The Iclandics have historically always been against, with the exception for some recent polls showing that a majority was in favour. Today that EU entusiasm have probably gone back substantially (a new poll showed that). I often get the question: How much does an MEP earn? Some politicians don’t like that kind of intimate question. I, on the contrary, find them very relevant. We are financed by taxpayers money, so the taxpayers have the right to know. According to our national MP standard: in my case, 4500 euros/month. Not according to the ticket price, but a lump sum based on the distance you have travelled: approx. 2000 euros/trip (to Brussels or Strasbourg). 1. Struggle as much as I can for reductions of these outrageous expenses (We should not get more money than a national MP; that should be the starting point of the discussion). 2. Give away the money I don’t need to do my work as a politician. I’d estimate that I donate 40,000 – 50,000 euros/year to grassroots organizations and my own party, the Swedish Left Party. 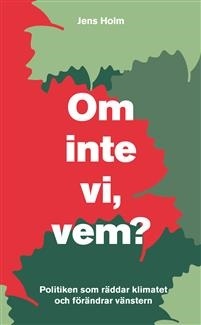 We have just launched: http://www.meatclimate.org/, on which the report The Livestock Industry and Climate – EU makes Bad Worse can be found on eight different languages. Toivo from Sweden, Jennifer from Spain, Herma from Germany/Belgium and och Zdenek from the Czech republic. Indeed very good atmosphere, with activists from Spain, Czech republik, Germany, UK, Sweden and the Netherlands. Among others the conservative MEP Edward McMillan-Scott showed up. He has just launched the ”green card” for vegetarianism. An unexpected but very welcomed allied. A lot of thanks to all of you that have participated in making this report possible in so many different languages! Welcome to the launch of the report The livestock industry and the climate – EU makes bad worse in four new languages: Dutch, Spanish, German and Czech. Previously also in Swedish, English, French and Croatian. Also launch of the brand new webpage www.meatclimate.org. European Parliament, PHS 1C051, 14.00–15.00 on Wednesday, 4th of March 2009. Please come and participate in the discussion. Meet vegetarian promoters from Belgium, Spain, Czech Republic and Sweden. Vegetarian as carnivore, all are welcome! report adopted by the European Parliament 4 February 2009. On Wednesday, the European Parliament approved the climate resolution “2050 – The future begins today.” I had negotiated for the Left group, GUE/NGL, and for some time prospects looked good. When the climate committee approved the resolution in December, we made the EU’s emissions limits stricter, requiring a 40% reduction in emissions by2020 and an 80% reduction by 2050. Those limits remain in the document approved on Wednesday but, unfortunately, many of the requirements placed on the meat industry were deleted. The part in bold print above was, unfortunately, stricken (the paragraph in the revised version was given the number 118). Naturally, it is positive that the parliament still acknowledges that the meat industry represents a huge climate issue. But it is most unfortunate, and altogether too typical, that the parliament lacks the nerve to demand that the most obvious measure be taken; that is, that meat consumption be decreased. Nevertheless, I thank the 162 MEPs who voted in favor of a reduction in meat consumption. The EU parliament has concluded that meat consumption contributes to climate change. That is the finding after todays adoption of the climate resolution, ”2050 – The future begins today” (rapporteur: Florenz). Nevertheless, the parliament declined to demand that measures be taken to lower meat consumption. The resolution concerned how the EU will act to combat climate change. It did not contain any concrete proposals for legislation, but laid a course for the future. The parliament has determined that livestock raising and the meat industry account for 18% of the world’s greenhouse emissions. • More stringent long-term goals for reduced emissions in the EU – a 25-40% reduction by 2020 and at least 80% by 2050. Thus, the parliament has shown its desire to go further than the legislation on climate measures approved in December 2008’s climate package, in which the goal is a reduction of 20% by 2020. • Acknowledgement that poor countries are the ones most severely affected by climate change and that the EU should therefore increase economic aid to developing countries’ efforts in this area. the lands that were stolen from them. have been arrested and another 400 are hiding in the surrounding forests. immediate release of all detainees.